The Harness Racing Museum & Hall of Fame - Let Us Help You Entertain! Ensure a perfect, trouble-free event tailored to meet your every need in this prestigious and unique setting. The Harness Racing Museum & Hall of Fame is housed in a magnificent Tudor-style stable, built in 1913. The unique setting of this historic site is beautiful, elegant and comfortable with an atmosphere to suit all tastes. 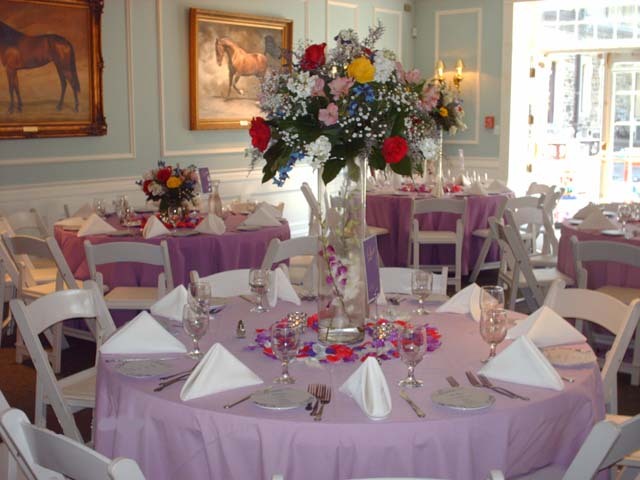 It is the perfect place to plan your Wedding Ceremony and/or Reception. The museum is located in the historic downtown Goshen, New York. Its elegant and timeless Haughton Hall can accommodate up to 125 guests. For larger groups our beautifully manicured lawn and garden provide a perfect stage for a country wedding celebration! 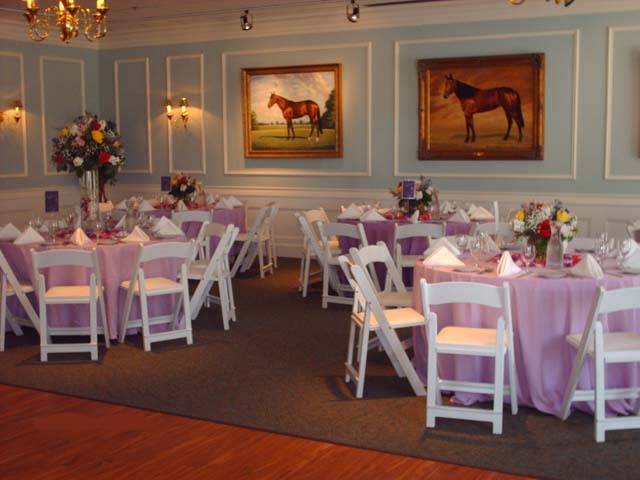 Whether you are planning a traditional or non-traditional affair, our staff at The Harness Racing Museum & Hall of Fame will ensure your special day is memorable. We are conveniently located just minutes off Route 17, on Main Street in the colonial village of Goshen. Only one hour from Manhattan, we are close to all major airports and hotels. Our facility offers a state-of-the art meeting place for up to 125 people, seven days a week. This unique historic setting is conveniently located just minutes off Route 17, on Main Street in the colonial Village of Goshen. Only one hour from Manhattan and close to major airports and hotels. Daytime events include full access to Museum exhibits until 5:00 p.m.
Screen, Flip Chart & Easel, Microphone & Podium. Our professional staff is here to provide the kind of service that allows you to know that your event will be special. By providing you with an arranged-to-order meeting or conference, your event is designed with your needs in mind. If you're planning a simple business meeting or an elaborate catered affair, we are dedicated to providing quality service. Let us help you entertain during your next anniversary party, sweet sixteen party, graduation party, bridal party, baby shower, confirmation party, bar/bat mitzvah, or birthday party. The museum is located in the historic downtown Goshen, New York. Its elegant and timeless Haughton Hall can accommodate up to 125 guests. For larger groups our beautifully manicured lawn and garden provide a perfect stage for a country celebration. * Caterers with Liquor License and Liability. If you are planning to have alcohol at your event, you MUST hire one of these caterers. Approved caterers must be used for all events. Any person wishing to reserve the banquet hall at the Harness Racing Museum is advised of this upon booking. This requirement is due to our limited facilities. To book your event or make an appointment to tour the facility, please contact the Special Activities Coordinator at (845) 294-6330 or email [email protected]. "It was great to work with you for my family reunion event. Everything was perfect, and the family was so happy that we were all able to get together. "The Harness Racing Museum is such a classy place to hold an event. The rooms are perfect, whether a half room or the whole room. The lawn area is beautiful with flowers. There is something for any age group there. The younger (and the older) people just love the simulator ride upstairs. "Over the years I have looked at different venues to hold events. This is done only as a comparison of some other o.k. place vs. the Harness Racing Museum, a spectacular place. I did this to keep other people happy, as in "see, what did I tell you" kind of conversation. Having any event in another location involves so much WORK! A lot of WORK Yes, I could rent somewhere else BUT that would involve me cooking/baking and bringing all the food, dragging in all of the silverware, glasses, plates, tablecloths, coffee urns, deserts. I would have been tired before the event even started. Then I would have the honor of dragging dirty dishes, tablecloths and GARBAGE back home. This is not a problem if the event is held at the Museum: I just pick one of the fabulous caterers, and show up smiling and ready for a party. And the caterers are fabulous! I have dealt with many of them over the years. I have never had a bad experience with any of them, and my family always raves about the food. "This is the reason I have chosen the Harness Racing Museum again and again for my special events over the years. The days were perfect for my daughter's high school graduation, then her college graduation, MY WEDDING, my mother's 80th birthday party, and our reunion event last weekend. There were also a couple other events scattered in there over the years. The fact that I was married at the Harness Racing Museum and kept going back for other events says it all. Ever met a totally happy bride on her wedding day? I was. I tell everyone it is the best place for any event. "The reason that all goes so well with the events is the great staff at the Museum. Gigi, you made it so easy to have a perfect party. I didn't have to worry about a thing, you were on every detail to make sure everything was right. I can't thank you enough for all that you did for our family. My mother had such a wonderful time, and we were all so happy to get together again. "It was a pleasure to work with you. Thank you again for ALL of your help, and I know we will be working together again on another future event!"